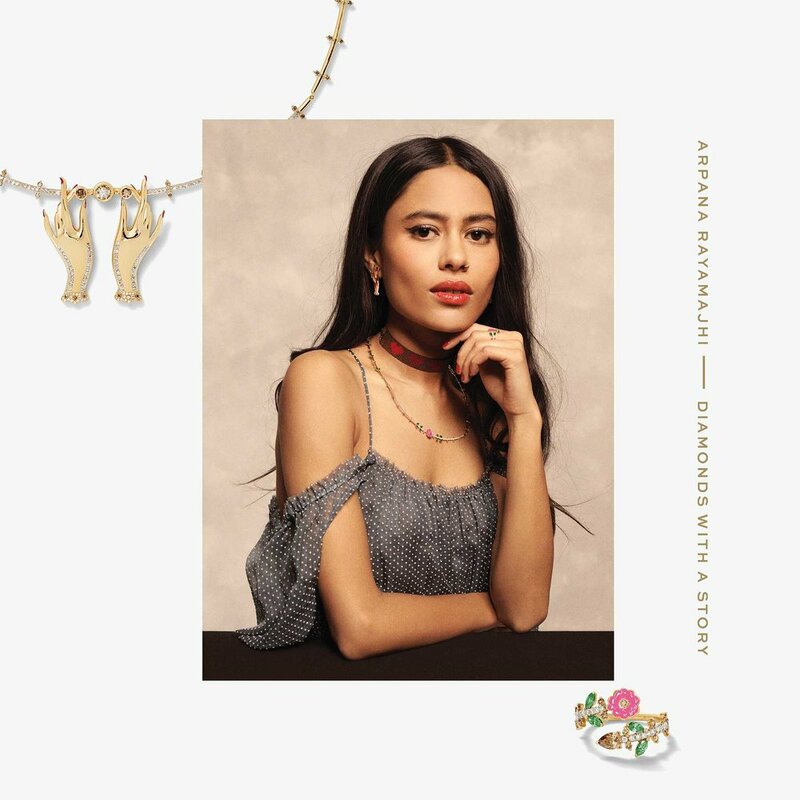 This collaboration between jewelry designer Arpana Rayamajhi and the Diamonds With A Story is at the top of my current covet list. The delicate, iconographic shapes and the subtly playful pops of color (in one of my favorite combinations: pink and green) have me daydreaming. The effort is one of several that the Australian diamond company has put forward, with other capsule collections by Eva Fehren, Arpana Rayamajhi, Ana Khouri, Alison Lou, Ileana Makri, and Anita Ko, all "inspired by the strong, confident women who wear their creations, contribut[ing] their unique style to a capsule collection that highlights the natural golden hues of Australian Diamonds." This collection is Rayamajhi's fine jewelry debut, as she typically creates with beads and tassels. The company is a unique one to make a debut with, as the diamonds are "traceable, natural, and responsibly sourced." "Arpana Rayamajhi (b. 1987) was born and raised in Kathmandu, Nepal. She received her BFA from The Cooper Union School of Art, focusing primarily on Painting and Sculpture. She founded her jewelry brand formerly known as ArpanaJewels in the summer of 2014. Like her paintings and sculptures, the jewelry are made in series. Arpana brings her Nepali heritage and craftsmanship to each of her pieces. Each piece is handmade and one of a kind. The jewelry use carefully curated collection of materials from around the world drawing inspiration from tribal / ethnic and pop cultures, Rock and Roll and Death. Arpana lives and works in New York City. In addition to her artwork and jewelry practices, she is also the co-­founder of DISPOSE, an online magazine collection of disposable photographs that narrate the day of an individual." 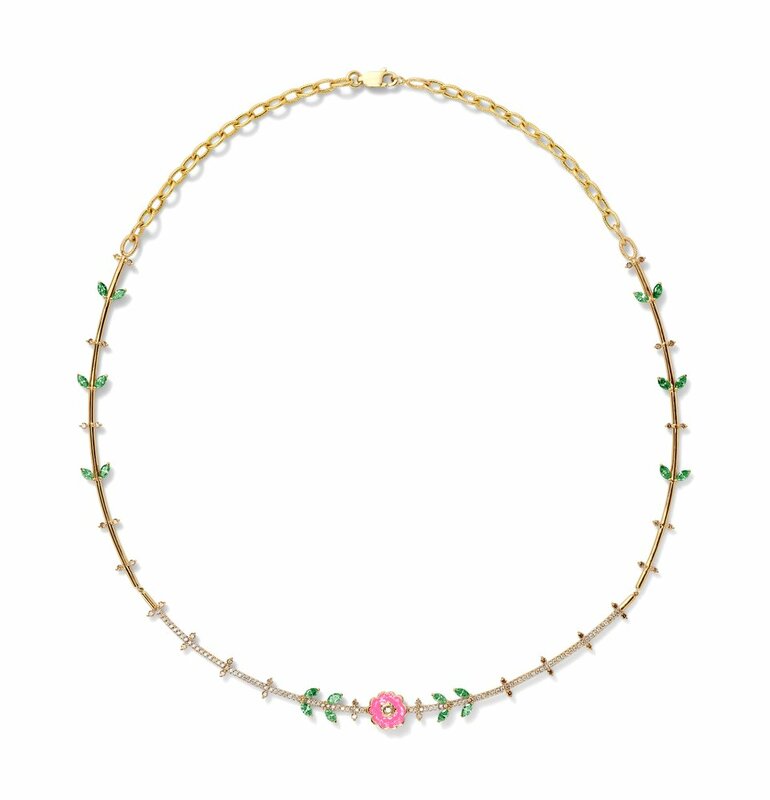 The necklace from the capsule collection. The collection is mostly a series that plays on the same motif of a small pink flower with simple, marquise-shaped green leaves in delicate symmetrical compositions on sinuous yet structured foundations. In Rayamajhi's words, "the shape of the flower is whimsical and slightly asymmetrical very much like they are in their natural state." Earrings from the capsule collection. The bracelet from the capsule collection. The ring from the capsule collection. The attitude is distinctly charming, whimsical, and simply pretty. There is an air of glamour and luxury without any excesses, and more importantly, without the feeling of taking itself too seriously. 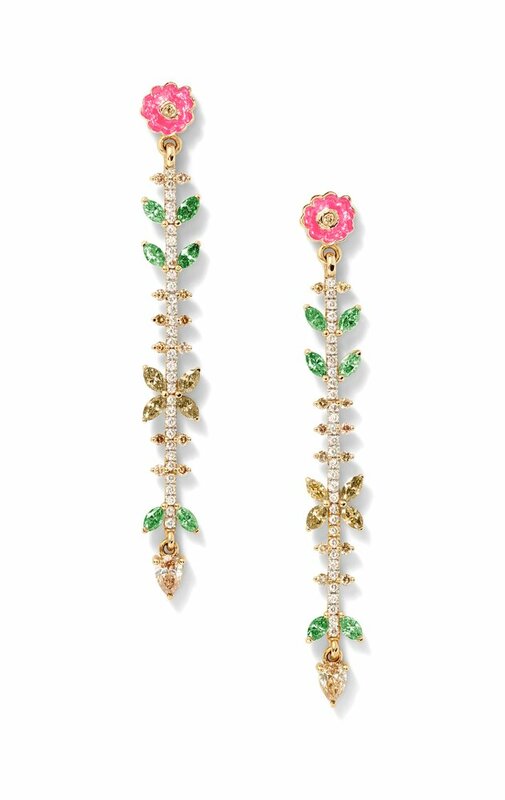 The second pair of earrings singularly differs from the rest of the collection. According to Rayamajhi, they were "inspired by hand gestures in Hinduism and Buddhism. However, the series is a celebration of art from the Himalayas and not religion. Tattoos are another source of inspiration. The idea of delicate hands examining a precious gem and holding it dearly is what comes to my mind." I find it incredibly inspiring to see how much the style of this collaboration diverges from Rayamajhi's own line. The medium that was presented to her clearly redirected her design decisions and allowed different aspects of her aesthetics and talent to come to light. It is always important to be reminded of the importance of materials, not only in how they are sourced, but also in how they inform creation. Bruna Tenório modeling the collection.